This is YUM YUM YUM!!! Please don't be put off by making the spaetzle from scratch, it really is quicker to make than you think. I made this last night and the whole thing took me 30 minutes from start to finish. I first saw this in a cookbook about Eastern-European cooking. Unfortunately I can't remember the name, but would love to buy the book - they have some very good recipes in there, including Uzska, some lovely little Polish filled dumplings, rather like ravioli... But I'm going off on a tangent again. The spaetzle is unbelievable and the addition of the bacon & celery just elevates it to heavenly. I'm 1/8th German (my grandmother's father came here from Germany), so this dish makes me feel all German! Or maybe that's just my excuse for eating copious amounts of it's buttery goodness?? 1. First make your Spaetzle - mix all the ingredients together until smooth. Set aside, while you bring a big pot of salted water to the boil and get started on the bacon & celery topping. 2. Dry-fry the bacon in a frying-pan until nice & crispy. (if you're using very low-fat bacon, you might have to add some butter here). Add the celery, turn the heat down to medium low, add half the butter and cook until softened and fragrant. Add salt & pepper to taste. I normally add a little bit of garlic to this as well, but not everyone is a garlic freak like I am, so feel free to leave it out! 3. By now your water should be boiling. Spoon the spaetzle mixture onto a big plastic/glass chopping board (I find those handle easier than the wooden ones). Now the labour-intensive bit starts, but don't worry, it goes very quickly! Holding the chopping board over the pot of boiling water, scrape the spaetzle mixture bit by bit into the pot, so you're forming little strands of spaetzle. Don't add too many pieces at once, I normally do this in 3 of 4 batches, depending on the size of the pot you have. The spaetzle will quickly rise to the top of the water - this means they are done and you can scoop them out with a slotted spoon. Continue until all the Spaetzle has been cooked. This should take no longer than 10 minutes for all of them. 4. 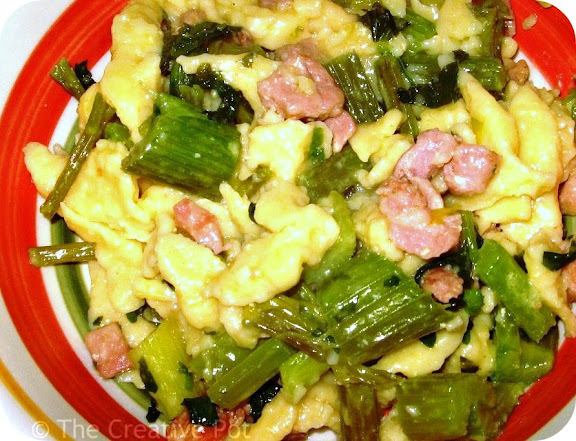 Now add your spaetzle to the bacon & celery mix in the pan, add the rest of the butter and fry for a minute or 2 to coat the spaetzle with all the flavours. Add salt & pepper to taste & serve while still warm. Optional: you can grate a bit of cheese on top if you want to go the full artery-clogging way (like we did last night...), but really it's just as delicious without.